Five essentials for planning and managing smarter learning spaces. An organized and highly functional equipment hub The Facilities Management Department at Bates College approached me last year around this time, and asked me to go through a storage/trash/holding area and get rid of unwanted items. I was looking at 10 years of collected electronics, put there by caring employees with thoughts and hopes that it would be “reused” somewhere else someday. Most people in a university/education environment know what I am talking about. An analog 32 x 32 RGBHV router (or two), system 8 switchers, 8 x 2 stereo/mono audio mixers, feedback eliminators, assorted, outdated control panels and processors, and even a stray slide-projector from 1970. While rolling the unwanted gear out to the recycle afterlife, I walked past two classrooms that were due for equipment and technology updates. Now, a year later, I sat down in one of the classrooms and reflected on the process of how it had gone from that “old pile of recyclable gear” to the modern, digital media presentation and capture system it is today. In the process, I created a list of five essentials of managing smarter learning spaces. CAN YOUR NEW DESIGN WORK WITH YOUR EXISTING STRUCTURE? Being able to work with the existing structure is critical in our world of cost-savings and budget cuts. Will the new design work architecturally, and will it physically look right in the space? Will the sight lines allow for changes to happen? Adding or changing equipment will undoubtedly change how we light the space, where fixtures will be placed, and the types of light we use. Keeping light from the projection screens is important, but lighting an instructor for class-capture purposes — while standing in front of the class — is also important. Existing duct-work for HVAC equipment may need to be moved or altered for placement of projectors, monitoring solutions, and microphones. HVAC considerations are really important for capture and phone conferencing. Direction of ducting and their total audible output affect where we can place our ceiling microphones and speakers. These noise levels will determine how many mics are needed, what types of speakers and power handling capabilities they will have. If the ceiling is drop-tile, don’t assume that a speaker can find a home in any of the tiles. How many of us have installed 10 speakers in a suspended ceiling only to find that the last two locations have a sprinkler pipe, conduit, ventilation ducts or some other obstruction ruining what was going to be perfect symmetry? Under the hood—In this Cat6 patch bay, the network wire is blue, DigitalMedia and video sources are yellow, and PoE devices and camera power are red. Newer technology inevitably will mean changes to what gets displayed and how we get images to the display devices. Floor-boxes and or wall-boxes may be too few, or of the wrong type and can no longer be used. New conduit runs can be expensive. Removing cement and core drilling will quickly run up the bill. A big plus for doing this is that all the connections to equipment from AV lecterns and podiums end up in one recessed wall-box with power, network, speaker, and system controls inside. WHAT DESIGN ARE YOU USING? Having a completed system design is another essential to being able to manage a smarter learning environment. System designs should include equipment lists, rack elevations, video, audio, control, network, and special millwork elevation drawings if necessary. 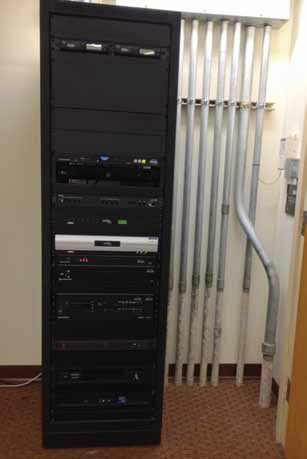 A recent system design for a digital media system with dual projection, class-capture, and upgraded sound yielded enough equipment to only require one eight-foot rack. The older analog system was two racks and the doors remained open due to heat from the system and poor rack layout. The system capabilities are now so far beyond where we started and to think we are down to a single rack. Another plus for upgrading. The design process will require someone to physically remove old wire and hardware that has been in place for 10 years (or longer). Getting wire out of the pipes so that the pipes can be reused is always easy, because no one ever went beyond the two-thirds fill rule and always had ample pull boxes in line. Right? Reality check. Realistically, if these pipes are not available, the entire scope of work can change. Budgets get broken. Our design called for new projectors that were smaller and had a center lens location. The old ones had a left of center lens location and different throw distance. The new location put the projectors directly under the cooling vents for the air handler. This was great for summertime operation when everyone was on vacation. It was not going to work for fall and winter classes when the heat kicked on through the same ventilation system. Time to move and re-mount projectors and have the ducting reconfigured had to be figured into the work timeline, and again the budget. We tried to find a projector to match all of our specs and not have to move mounts and reconfigure the ceiling but, in the end, we were going to make sacrifices in image quality and brightness that we were not willing to accept. Getting IT professionals involved early on in the project is paramount in building and managing a smarter learning environment. Digital media puts a huge amount of responsibility on the network and the people managing that side of the house. In order for the equipment to interface within the system, all the major pieces get their own MAC address and network port. In a typical system that means a touch panel, its respective control box, a system control processor(s), DigitalMedia boxes at podium locations and projector locations and network for any computers in the classroom. We then have to allocate networking for cameras, audio processing and teleconferencing equipment as well as the class capture systems that we now are seeing more and more of. As new digital systems come on line, the issue of bandwidth has to be addressed. Teleconferencing, video chat rooms, Skype calling, and live streaming can become networking nightmares. As new digital systems come on line, the issue of bandwidth has to be addressed. Teleconferencing, video chat rooms, Skype calling, and live streaming become networking nightmares. Server space in most facilities is already at a premium due to smart phones, online gaming, and wireless network traffic. With the above being said, is it time for the classroom technology departments of future learning environments to consider having networks and servers allocated solely for their use? IT managers and AV professionals have to partner and work very closely in today’s digital world in order for us to have modern, productive, and reliable learning environments. Keeping current with the evolving technological landscape in education will aid in the design and build out of a well-equipped classroom that is not only functional, easy-to-use, and future-proof (at least for the next three to five years), but also architecturally pleasing to building designers. As advances in our control systems become more visible to designers, engineers and architects, we find ourselves getting deeper into “green” building technology. We now use the AV control system, in conjunction with motion detection and room occupancy sensing, to control lights, shades, HVAC systems, and security. Remote monitoring and control capabilities makes the initial cost easier to absorb when the trade off is increased savings in heating, cooling, and electrical bills. Additionally, factor in reduced time having to physically flip switches and controls. DigitalMedia systems today make use of HDMI, fiber optic, DVI, CAT6e, and multiple other cable and connector types. With these signal types we have to now work with 16:9 and 16:10 screen formats. For those in the installation side of the business that have been around for a while, this changes how systems are designed and built. No longer do we pull multiple runs of RGBHV, RG 59, and all that bulky, heavy copper. Now a couple of runs of Cat6e to and from sources and displays and that’s the extent of wire pulling. Terminating wire and those long nights behind racks putting BNC connectors on (by the hundreds) no longer exist. Rack wiring techniques have truly changed because we use pre-made factory cables with both ends already on, which begs another question: What do you do with all the extra cable if we no longer custom-make them to length? Class capture systems are essential to managing a smarter learning environment. Capture systems allow for instant access to media content that only those in class would have. Students with serious illnesses or injuries can now catch up on missed classes. Those with learning and physical disabilities, no longer need to be “in” class to be able to take advantage of capture technology. Streaming capabilities and class capture systems allow us to bring the class to numbers of people who previously we’re not able to attend in person. At the recent commencement ceremony of our new college President, we were able to provide overflow viewing of the event, for up to 300 more people, in three separate spaces on campus. Management of the material, systems for the storage of the content, who has access to it and how we secure this information is still a topic of extreme controversy. As we take that journey down the hall and look in on our accomplishments, take a look across the hall at the new challenges that lay ahead. The new room across the hall was just finished, but does it meet your expectations? Does it have all the features you need? Are those features easy to use and reliable? Did the costs justify the time and labor expended to reach your goals? Whatever side of the hall you are on, the digital age is upon us and we will all — sooner or later — walk by that stack of old analog gear and step into the classroom of the future. Gary Russell is an A/V Engineer for Bates College in Lewiston, Maine. He has more than 30 years of experience in varied audiovisual-related trades, including installation, mobile production, bench repair, Airbourne Video Specialist USAF. Gary has his InfoComm CTS and Crestron DMC (T.E.D.) certifications.